← Raves for The Wishing Map! Did you know that Mr. Rogers was an ordained pastor? 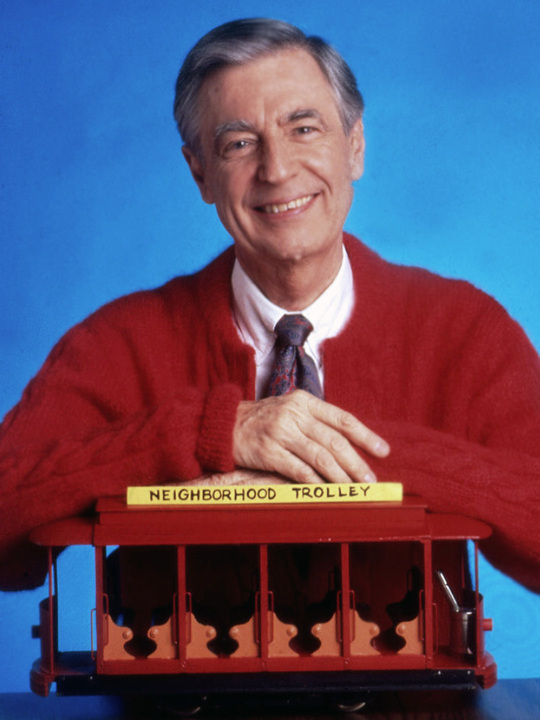 Yep, that Mr. Rogers, the beloved never-met-a-sweater-he-didn’t-like children’s TV host. What would it have been like to attend a church service where “Pastor Rogers” preached? Stop! Don’t watch the video yet—or no milk and cookies for you! 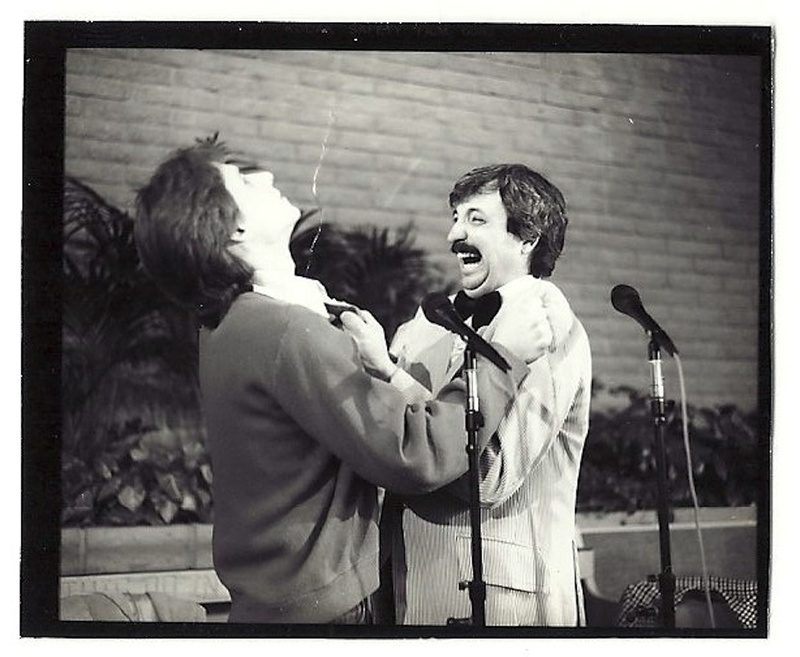 I was in the comedy act Mitch & Allen from 1982 to 1988. Which is why, to this day, people call me “Mitch.” Well, that and because my name is Mitch. Riffing on what Mr. Rogers would be like as a pastor, Allen once ad libbed a few lines during a performance, and the audience loved it! So we started wondering how we could turn it into a sketch. The answer came in the form of Mr. Deacon, a religious hypocrite who would be foil to Pastor Rogers’ laid-back zingers. OK, you may watch the video now (from Mitch & Allen Live! 1983). But come straight back when you’re done. And don’t get lost! “God loves you, but if you don’t get right, he’s gonna fry your face off!” A smidge condemning, perhaps. But it sets up the contrast between Pastor Rogers’ convicting words and milquetoast delivery. But first, a word from Mr. Deacon. Have you ever known a religious hypocrite? I guest-preached at a church in Chicago one Sunday. It was a great morning. Until a stiff-suited man came up and rebuked me for “cussing,” then turned and walked away. “It’s the real-life Mr. Deacon!” I brain-snorted. Psychologists call it cognitive dissonance: the uncomfortable state of living at odds with what you believe. * To resolve it, you have to make one of two choices: either live what you believe, or believe what you live. The first takes effort. And humility. The latter is easy, but requires some mental twisting. E.g. Do you steal from the company you work for? Hey, don’t stop stealing, just tell yourself, “They underpay me and they know it! They expect this. It’s an unofficial fringe benefit.” Voila! You now officially believe what you live. Jesus’ message really is that simple. He tells us we must “become like little children.” (Matthew 18:3) Before an infinite Creator, how could it be any other way? There’s nothing we can give God—and nothing else he wants—but our love. The real Mr. Rogers understood that. Come to think of it, he was a pretty first-class preacher! Now, who’s up for milk and cookies?! If you preach or teach, or would simply like to own a copy of this video, you can download it here! *This is one of several ways in which the term cognitive dissonance may be applied. This entry was posted in For Pastors and Teachers, Humor, Memoir, Popular Culture & Entertainment, Religion/Faith, Videos and tagged God, hypocrite, Mitch & Allen, Mr. Rogers. Bookmark the permalink. 19 Responses to Pastor Rogers? Mitch I do not always take time to read a ton of things on email or Facebook. I had a short break before from the Jail and during my short break I saw the show PASTOR ROGERS. I ended up puting this on my FACEBOOK. Mitch just another reason why I am thanking God I am back connected with you. And you wrote the script too, didn’t you! Delightful fun yet makes a strong point. Praise God that he exchanges our wrongdoing for his righteousness, when we invite Jesus into our lives! Actually, Allen and I co-wrote the script. Thanks, Nancy! The wwseps nearly killed my faith. I read In His Steps at 14 and often since then. It helped me to understand where I wanted to be and how difficult it is for everyone to live this way. ♥. Ahh. First time I’ve seen that as an acronym. That was my own shorthand to get the thought down then forgetting to go back and write it out. =) ♥.